for Digital Audio Workstations including ProTools. The recording certificate is designed to teach how to record, mix and produce your own music or the music of others. Through the use of creative technologies, and rigorous academic standards, the Institute seeks to challenge students to think, create, and communicate. Classes cover advanced skills and techniques required of a professional recording engineer and provide the techniques and experience required to become a Master. Classes are also helpful to simply learn how to make your recordings and mixes sound better. These classes help take you to the next level of expertise. The most important aspect is we teach how to make music and recordings that touch a person deeply — physically, mentally, emotionally and even spiritually. We incorporate our Sound Healing expertise to take your productions to a level no one could previously imagine. At the Institute, you will be working on the same equipment used by top professionals in the field. Classes are small enough so that each student gets plenty of personal attention and support. Even more importantly, the classes at Globe Institute are Hands-On Intensive. You will get enough hands-on experience to learn how to run any particular type of equipment well and with confidence. 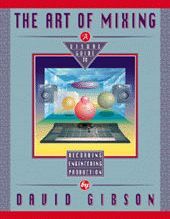 David Gibson’s book, The Art of Mixing, is the primary text in the classes. “The Art of Mixing” is the top selling book in the field of Audio Recording for 15 years. It is used in just about all Colleges that teach audio recording around the world. The book uses a visual framework for understanding all that can be created in a mix. With the visuals you are able to see the different values and traditions that have been developed for recording and mixing different styles of music and songs. Understanding of the complexity of these dynamics is crucial for a recording engineer to be able to consistently create great mixes! Visuals make complex structures of mixes simple. 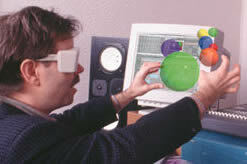 This visual conceptualization of sounds in a mix is also being developed into a 3D visual system. that sets Globe apart from all other schools. However, we teach more than just how to be a Recording Engineer. We also teach how to be a Producer. You will learn how to produce and refine your own music or someone else’s. The classes utilize the book, The Art of Producing, written by David Gibson and Maestro Curtis. “The Art of Producing” teaches a process for Producing any style of music — either creating the music or just critiquing all of the music components of someone else’s project. We also teach Music Theory so you can create arrangements with different chord progressions. And, we teach Voice and Piano so you can sing or play the music in your head for those you are working for. Classes begin by covering all the details of each piece of equipment, so you know what everything does. However, what is most important is the way that all the equipment works together to make things sound good. Once you know what the knobs do, which way do you turn them to make it sound good? It is mixing that is the most difficult to learn. You can read the manuals and learn what the equipment does, but under-standing how to use the equipment to make it sound good is the tricky part. It is the classic challenge of learning how to create great art with technology. Visual representations of “imaging” (the apparent placement of sounds between the speakers) provide a tool to show all the different possibilities available to the recording engineer in a mix. Just as music theory was developed as a tool to help explain the dynamics found in music, the visuals are used as a framework for describing the dynamics that occur in a mix. Using visuals of mixes, we can now see and discuss the artistic values that people use when creating one style of mix or another. When you have a framework for remembering what is being done in mixes — you then develop your own perspective and values (or maybe your values are already developed and you just need to know how to use the equipment to get what you like). You then have complete control over the mixing process, and you can do whatever you like — because you know! This is the art of being a great recording engineer. On a more detailed level, the Art of Mixing is the way that the engineer uses the equipment in the studio to enhance and bring out the magic (whatever that is to you) in the music and song. A mix can be transparent so that the music or song shines through; or, a mix can be used like another instrument — to create a musical dynamic. The mix can even be used to create tension in a song. Creating mixes that fit the music or song in a creative way is the artistic challenge of the recording engineer. First, it is important to get to know the complete array of feelings and emotions (dynamics) in music and songs. Next, you get to know the complete array of feelings and emotions (dynamics) that can be created with the equipment in the studio. You then match the two based on your own feelings — in a way that creates art. Besides basing mixes on what feels or sounds good, there are also traditions that have been developed for each style of music. For example, Big Band Music and Classical Music have very strict traditions as to how they are mixed. On the other hand, Rap, Hip Hop, and especially Dance, Electronica and Techno have much less defined traditions. The primary tradition is that the 808 Boom Kick is loud and out front. It is important to understand these traditions because many bands want the mix to sound just like the style of music they do. But also, when you see these limits, you can then push the limits, and help to change the world. 1) We feel (and hear) the soundwaves that come out of the speakers and travel throughout the room, and 2) We imagine sounds to be floating between the speakers. 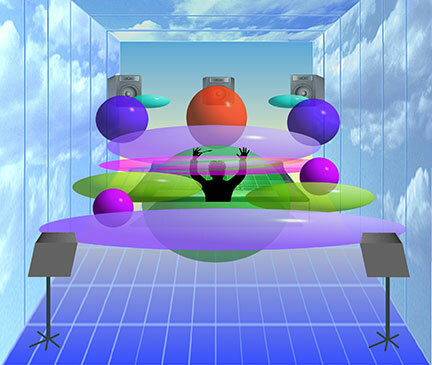 The visuals represent the imagined sound image. 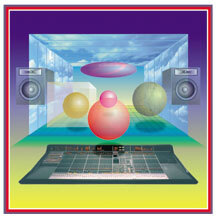 Sounds are represented as spheres because they best mimic the reality of how much space sounds take up in a mix. Also, the images are transparent because when two sounds are in the same place in a mix, we can normally still hear both of them. Panning is naturally represented as left to right. 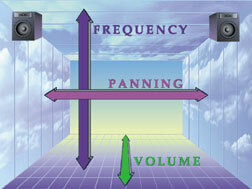 Volume is represented as a function of front to back — because things that are closer to you are normally louder! Pitch is represented as up and down — because high frequency sounds appear higher between the speakers and low frequencies appear lower (Check it out on your own speakers). This is probably why high frequencies are called highs… and low frequencies are called lows. Using this precise mapping of Pitch, Panning and Volume as X, Y, and Z axes, we can now map out a mix visually. Various styles and types of mixes (particularly those associated with a particular type of music) become clearly apparent. Different mixing “signatures” can now be dissected as to what the engineer did to create the mix. But most importantly, the problem of “masking,” where one sound seems to hide another sound in a mix, becomes visually apparent. As you can see, not only are the visuals interesting, but they are an important educational tool for teaching mixing theory and no other school in the world is using this system. Simply having a framework that you can use to understand and remember all that is going on in mixes is helpful. But most importantly, it gives you a theoretical tool for conceptualizing what you want to do in a mix before you start turning the knobs. Then you are in control of the mix, instead of it controlling you. This gives you an incredible edge when it comes to obtaining a job and becoming a truly great recording engineer, or simply learning how to make your mixes sound better. The Institute helps all students obtain Internships in the field. Being so well known in the Bay Area we often have studios call us to hire our students. We also help students with Resumes and Interview skills. There are 6 main areas where our students succeed. There are 4 main avenues to develop a career as a Recording Engineer. a) Recording Studios – Although more difficult to break into, professional recording studios give free studio time for every hour of intern time. Also there is nothing like being around an atmosphere full of major musicians and productions. You can’t help but absorb some high level information and techniques. If you are destined to be one of the top engineers in the world, then this might be your route. b) Home Recording Studios – Often students know or come across someone who has a nice home studio that could be developed into a fulltime business. c) Your own Studio – Inexpensive equipment makes it so it is not unreasonable to setup your onw facility. In the past, many students have actually joined together to create successful studios. Doing freelance Producing can be most satisfying — both emotionally and financially. And, of course, there is always that big carrot in the sky if you were to get a hit. Producers get royalties whereas Engineers normally don’t. a) Audio for Video and Film – This is the highest paying and consistent job available. b) Audio for Websites – Can be a nice source of extra income or a serious job if you were to get hooked up with a Corporation. c) Audio for Games – This is big business and some of the top game makers are right here in the Bay Area. You could end up doing Live Sound for a band, a small club or for major concert productions. You could work for one of the local Independent Labels, one of the Major Labels, or do as most do after graduating. Start up your own label. Our facility houses three recording studios, each with Pro Tools Digital Audio Workstations, Ableton Live, Omnisphere, Stylus RMX, and the highest quality microphones, mic preamps, effects, processing and monitoring systems. Every computer in each studio is filled with a fully array of software effect plugins. Combined with the expertise of our instructors we guarantee our students the highest quality sound possible.